Cynthiana, also known as Norton, is the oldest native North American variety in commercial cultivation today. Popular in the mid-Atlantic and southern states, Cynthiana has found a home in Georgia, and especially at Three Sisters Vineyards. Established in 1996 and bonded in 2000, Three Sisters Vineyards is Lumpkin County’s first vineyard since prohibition and holds the distinction of being “Dahlonega’s First Family Farm Winery.” Located eight miles northeast of the site of the first major US gold rush, Dahlonega, the farm’s name was inspired by the property’s spectacular view of Lumpkin County’s Three Sisters Mountain. 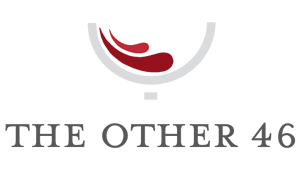 An advocate of drink local and 100% Georgia Grown, Three Sisters only produces wine from their twenty-plus acre mountainside vineyard. Their plantings include Cabernet Franc, Merlot, Cabernet Sauvignon, Pinot Noir, Pinot Blanc, Touriga, and three distinctive clones of Chardonnay-as well as the French-American hybrid, Vidal Blanc and the East Coast’s popular Native American varietal Cynthiana-Norton. 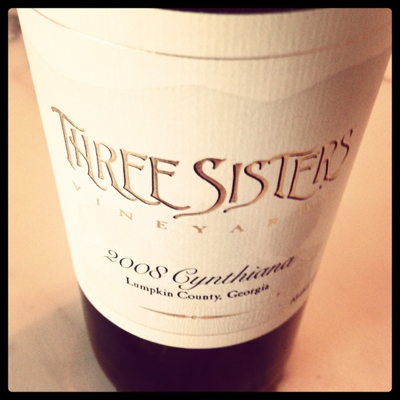 The Three Sisters Vineyards 2008 Cynthiana is a lovely deep, rich color in glass, with a nose of blueberry and black fruit. On the palate, medium-bodied with plum, black cherry and a touch of oak. The wine screams for food (perhaps a hearty beef stew or grilled venison?). A part of me thinks this wine could go another two to three years, but drinking so well now, why wait any longer. Well done. Like all Norton (Cynthiana) wines, ~ each bottle needs to ‘rest’ for four to seven years and needs an extended amount of time to breathe before serving. The first sip will generally be malic (acid), followed by a more favorable follow up taste. Thank goodness not all the best good Norton wines come only from Missouri and Virginia. Great examples can be found in Georgia. Three Sisters certainly is a favorite, but take a look into Crane Creeks Vineyards’ Hellbender Norton. To date, Georgia sports eight wineries producing Norton wines with a ninth in the wing. Cavender Creek and Tiger Mountain’s releases improve yearly. Frogtown Winery’s cost-to-product is not quite inline at this point, but improvements are on the horizon. Though there are now 278 Norton wineries in 25 states, Georgia amazingly holds its own against the competing vineyards. For any in little old California?